As I begin to write this I'm not even home yet and next year's trip is already in the works. The gears are grinding and I'm trying to figure out how I'm going to swing a trip to the Alaska Range for several weeks next year. Perhaps I'm a bit delirious; it could be the jet lag, or the strange sleep schedule one keeps on alpine climbing trips, or the really long Alaskan days. 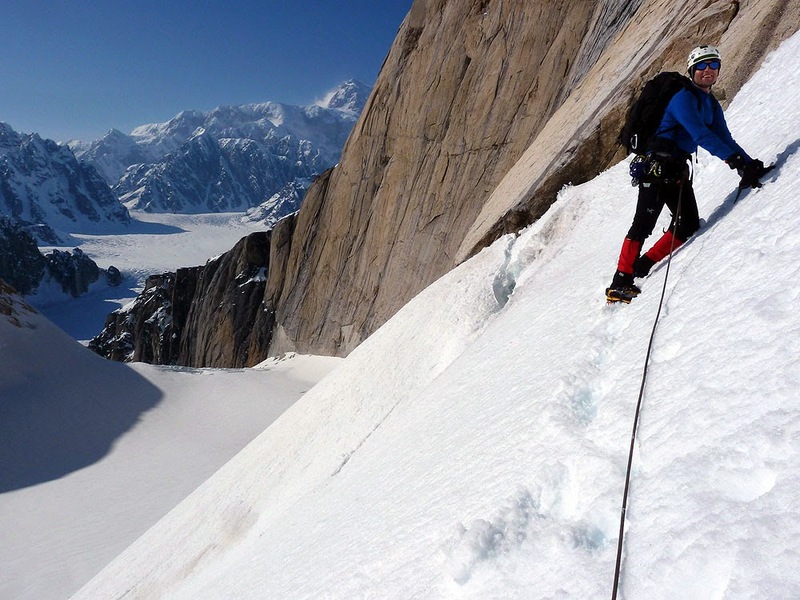 One thing's for certain, the Alaska Range is one of the most amazing alpine climbing areas in North America. Marty, the owner and director of Alpine Endeavors has been dreaming of going to the Moose's Tooth since he began climbing. This year, with a very wonderful regular Alpine Endeavors client, Richard Vlasak, interested in the trip he planned a six-day late April trip to the Ruth Gorge. 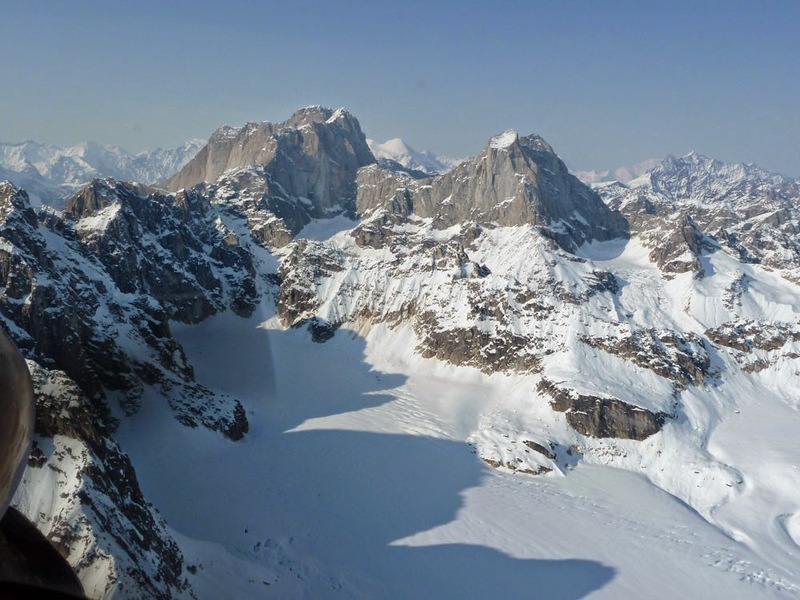 The planned objective would be Ham and Eggs on the south face of the Moose's Tooth, situated above a small pocket glacier 2000' above the Ruth Gorge proper. With two young children at home and a busy guide service to run Marty didn't feel like he could get away for the eight-day trip. Five weeks ago he dropped the trip in my lap. What was I supposed to say? No? No way. I was in, immediately. He didn't have to twist my arm. So, after a few weather delays and several airline customer service calls I left Hartford on my way to Alaska. Twenty hours and several layovers later I was in Anchorage and less that a day after that Paul Roderick of Talkeetna Air Taxi dropped us off below the Moose's Tooth. It was almost too easy. Richard and I were standing below a nearly unbroken 3000' wall of golden granite under the bluest of skies. The flight in to the Root Canal, like most other glacier flights, is nothing short of spectacular and can only be performed in good weather. Paul flew us and two other climbers in under deep blue windless skies. It was the kind of weather that doesn't last very long. 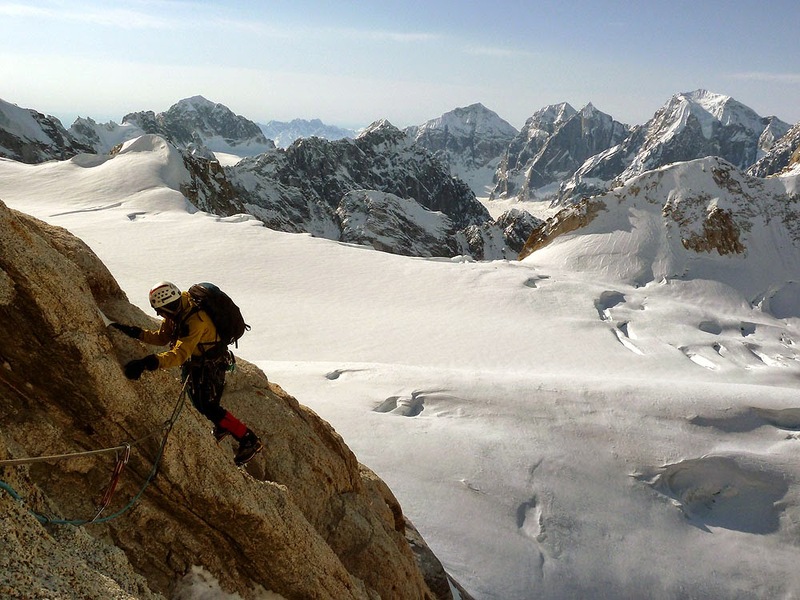 One of the harsh realities of this style of climbing, where a glacier flight is mandatory, is that travel days and climbing days require the same type of weather; those near perfect clear days. 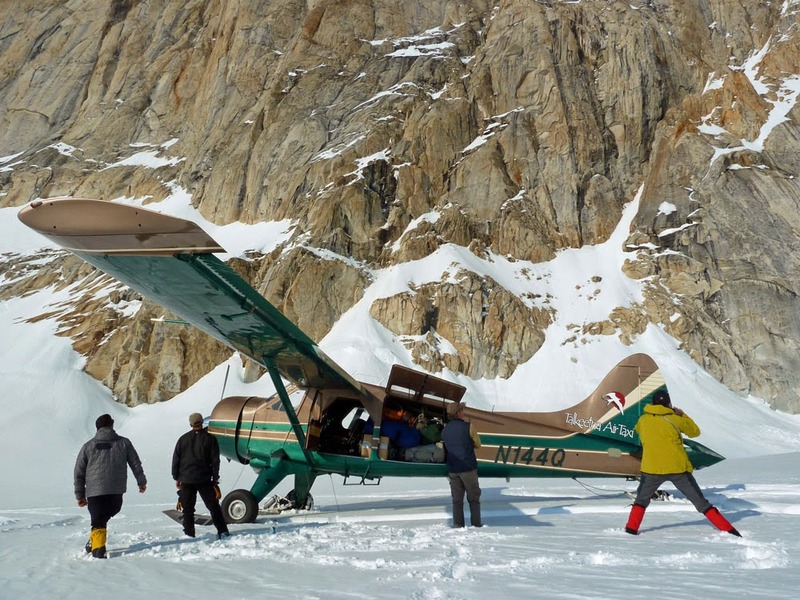 Even the slightest blip in the weather leaves you grounded on the airstrip waiting to fly, or stuck in camp on the glacier waiting to climb. My last major northern trip, to the East Ridge of Mount Logan in 2003 was a lesson in patience and a reminder that much of the time it isn't your skills that determine if you summit, it's the weather. On that trip 12 of 18 days were spent waiting out the weather. Richard and I set up camp and went to sleep, determined to make the best of the blue skies that were currently overhead. With a party slated to climb Ham and Eggs we decided to walk over and check out Shaken Not Stirred. Shaken is a slightly shorter, harder, narrower version of Ham and Eggs with mostly moderate snow climbing and occasional vertical mixed/ice bulges. It's an amazing natural passage up a really imposing wall. We were told by another party, and quickly realized, that the route wasn't in great shape. Richard and I bypassed the normal start using a gully system and snow ramp to the right of the route. Five pitches later we were back on route in the couloir. The detour had cost us a lot time though (even though it's easier climbing it is circuitous) and left us concerned about the condition of the route. 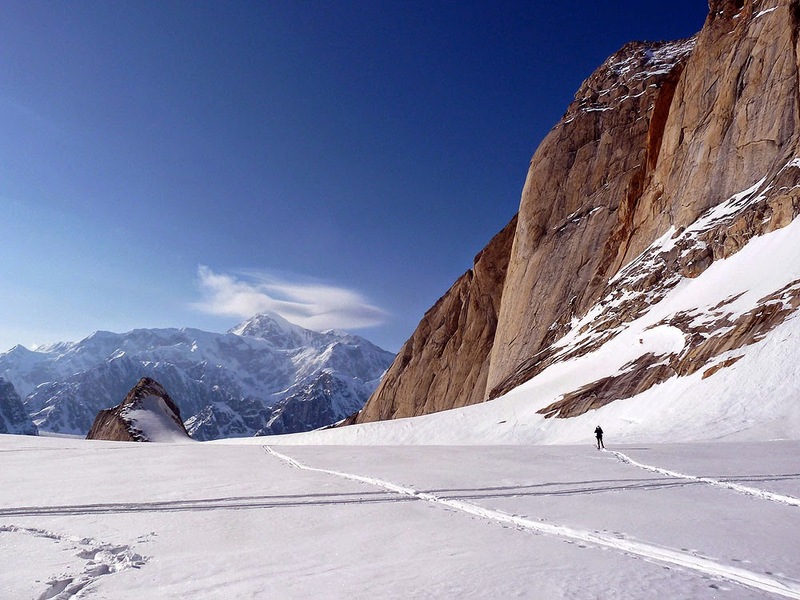 An abnormally low snow season combined with the early season conditions (a lack of freeze-thaw) meant that there was little more than overhung sugary snow and unprotectable thin ice at each chockstone bulge. A few pitches later we decided to go down. 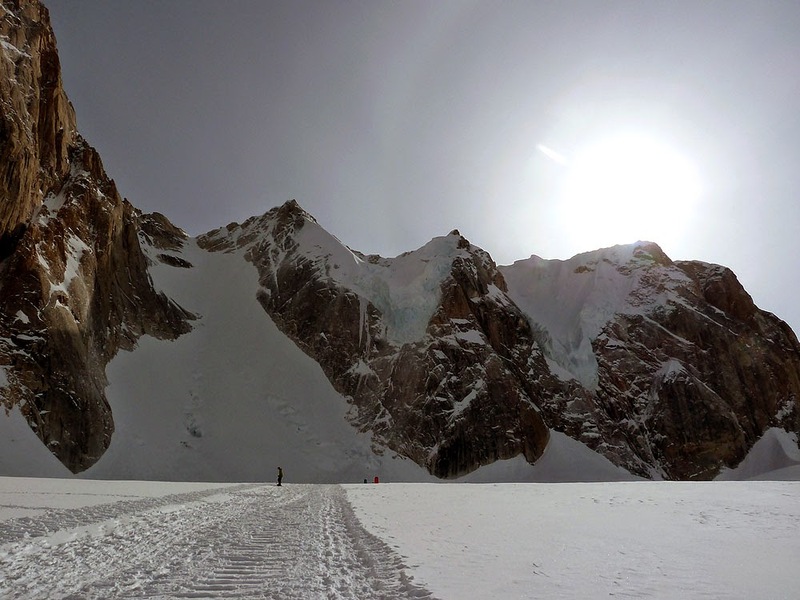 The sun had begun to swing around into the couloir and the climbing didn't match our topo of the route. In Talkeetna, upon our return from the Moose's Tooth, we bumped into several other climbers who had been to other spots in the Ruth. They confirmed what we had been seeing – the Ruth didn't have much ice this season. Rappelling out of Shaken Not Stirred is a frightening experience. In 2003 a party fell several hundred feet on Shaken when one of their rappel anchors failed during their descent. Luckily, and unbelievably, they were alive after their fall. I learned quickly that you shouldn't pass up a rappel anchor, even if you've descended less than 100'. The granite is almost crack- free and fixed anchors are hard to come by. On several occasions I found myself climbing back up the couloir to get to an anchor I could barely reach (remember the low snow?) that I thought was too close to my last anchor. The rappel anchors ran the gamut, from decent to utterly abhorrent frightfests that left me not wanting to lean back. 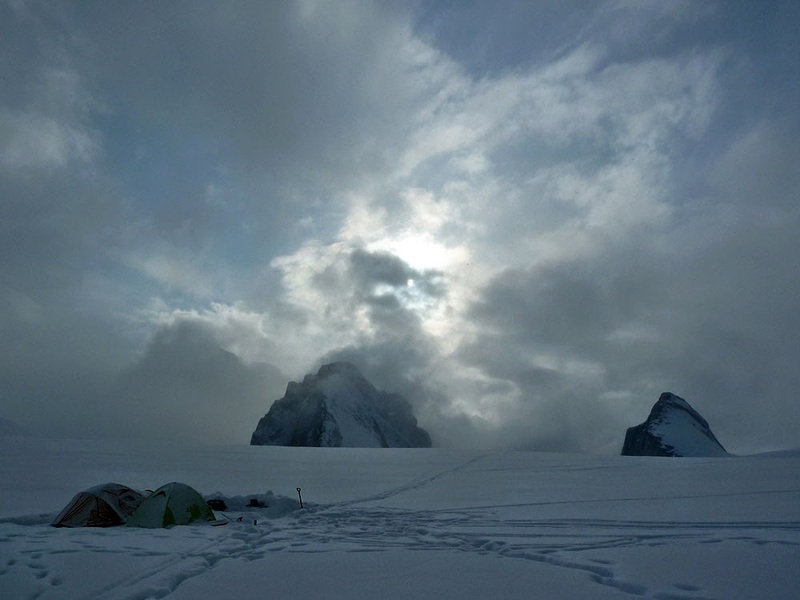 Safely back on the glacier, Richard and I snacked and made our way back to camp in the sweltering midday heat. With another party queued up for Ham and Eggs, Richard and I took an easy day. After a late start and a pancake breakfast we headed to a little bump on the Root Canal just before things drop precipitously to the Ruth Glacier 2000' below. A 30 minute walk, a short snow slope, and some scrambling put us on top a little peak that probably looks quite commanding from the Ruth Gorge proper but barely stands out from the Root Canal above. [singlepic id=610 w=320 h=240 float=right] Had it been clear we would have had amazing views of the Cobra Pillar and Japanese Couloir on Mt. Barrille and the unbroken 5000' tall face of Mt. Dickey. Unfortunately this was the beginning of a cloudy weather pattern that would deposit 3 feet of snow over the next two and a half days. With 4” of new snow during the day the party on Ham and Eggs managed to summit and avoid any slough avalanches in the couloir. There had, in fact, been only one spindrift avalanche during the whole day. This was a good sign for Richard and I, as we were planning to give Ham and Eggs a try the following day. We awoke at 2:30 the following morning to clear skies and very little overnight snow accumulations. Great, I thought, we can give Ham and Eggs a go. 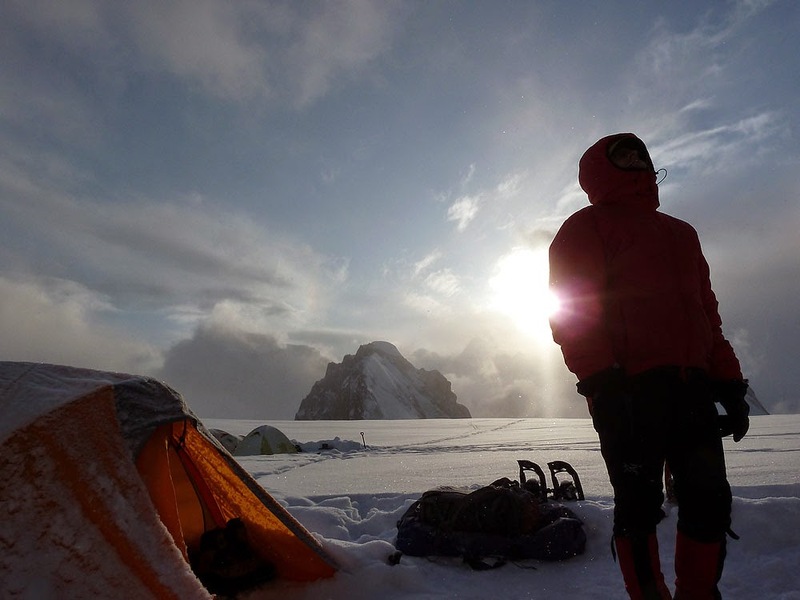 Richard and I did our business in camp and headed over to the start of the snow traverse to gain the actual route. As the sky lightened and clouds descended it began to snow higher up. With the colder morning temperatures and thicker cloud cover than the previous day the new snow wasn't staying in place. As I belayed Richard to the top of pitch 2 the couloir to my right (where the actual Ham and Eggs Couloir begins) avalanched 5 times. Richard gained the belay as spindrift began flowing over our heads and the spindrift avalanches from Ham and Eggs to our right had begun to fill the air around us. It was time to go down. 4 very business-like rappels put us on the ground safely. As I walked back towards camp, Richard ahead of me, I turned back frequently to stare at the 3000' tall monolith that had just shut us down twice in three days. Richard seemed to understand that this was how the alpine game works; he was okay with getting shut down. Ultimately I would be too, but not right now. How was it possible that we weren't able to climb these routes? I'd put up half a dozen M8 first ascents in the Catskills and guided 1000' of WI5/5+ in a day at Lake Willoughby this winter. The fitness I had gained from these exploits was supposed to carry over to the mountains. Weather happens though. So much is decided by the weather here. If it's good you may very well summit, and if not you just have to roll with the punches in camp. Cloudy weather forecasts for Anchorage and Talkeetna frequently mean snow for the mountains.It continued to snow until the night of the 23rd. Paul Roderick would be picking us up on the 24th provided the weather was good. Anyone who's waited around in camp for weather to clear knows the drill; Eat, sleep, urinate, defecate, and repeat. Too little sleep is hard on one's body, but so is 14-16 hours a night for several nights in a row. Mystery soreness appears and boredom can drive you crazy if you're not careful. 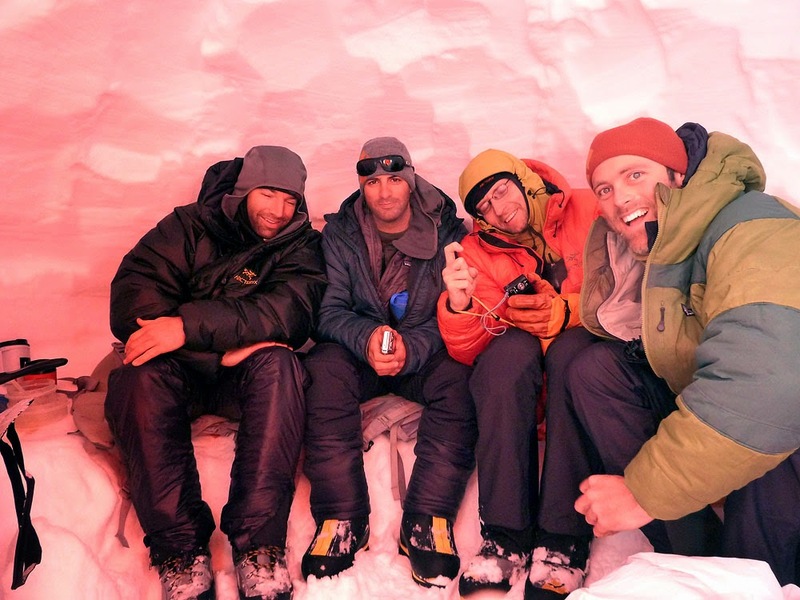 Richard and I opted to dig a large snow cave with two of our campmates. This shelter gave us a nice, yet soaking objective and ultimately allowed us to cook and hang out in a sheltered, windless spot. We made two friends, Chris and Aaron, in the process. Rangers from Yosemite National Park, they were on a vacation of their own and had climbed Ham and Eggs the day before we attempted it. When Paul Roderick of TAT came to pick us up the 24th he would be transporting them to an airstrip below Peak 11,300. On the evening of April 23rd the clouds began to lift and we were treated to the first blue skies in three days. Tomorrow was going to be a bluebird day. Paul would definitely be picking us up tomorrow. Leaving unclimbed objectives behind is bittersweet. It's nice to return to take showers, eat burgers, and catch up with friends and family, but the lack of a summit and “success” is a tough pill to swallow. It's a good reason to plan another trip, dig another snowcave, make new friends, and try to scrap your way up some giant Alaskan peak. 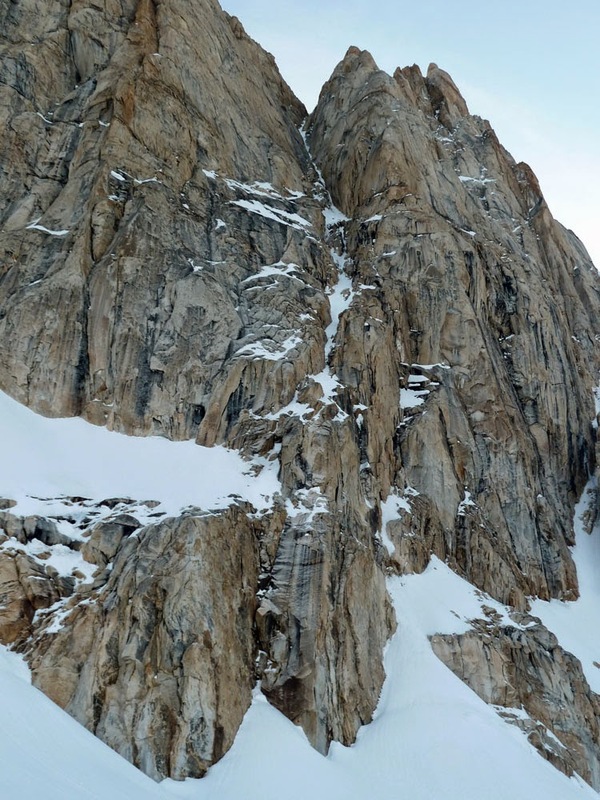 Sadly, at 1 a.m. on Thursday, April 27th a climber, Chris Lackey, from Houston TX was killed on the Root Canal when a serac collapsed on the Bear Tooth above camp. He was most likely one of the three climbers we met in passing as Paul Roderick shuttled us out and another party in to the Root Canal. The serac avalanched routinely when we were in camp, but must have had an extremely large piece calve off due to a small earthquake registered by the USGS at approximately the same time. The debris displaced by this ice fall blew the five climbers on the Root Canal out of there tents and scattered gear all over the glacier. A rescue was mounted the next morning and Chris Lackey was pronounced dead in the helicopter on the way out from the Ruth Gorge. Please keep him and his family in your hearts and minds. It could very well have been any one of us.